Director of Public Works Mr. Raoul Pemberton [blue shirt] explains work progress to the Minister of Community Development in the NIA the Honourable Hensley Daniel [green shirt], Attorney General the Honourable Patrice Nisbett [green tie] and Permanent Secretary in the Ministry of Works Mr. Ernie Stapleton [pink shirt]. NIA-CHARLESTOWN, NEVIS (February 10TH, 2011) — In a heart-warming speech delivered last Thursday [Feb. 4], Attorney General [AG] and Minister of Justice and Legal Affairs in the federal government the Honourable Patrice Nisbett expressed his delight that residents of the St. James parish will, later this year, receive a state-of-the-art community centre. “This is an area which is very dear to me: it’s an area where I have walked, it’s an area where I have lived, it’s an area where I grew up so I know we have suffered as a result of the lack of such a facility,” Minister Nisbett said, adding that no other Area Representative had ever built a community centre in that area. 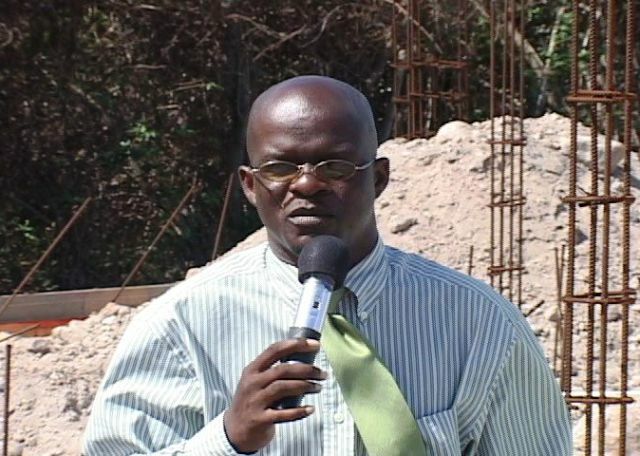 While the building is being constructed in Combermere, it is expected to serve residents of Rawlins Pasture, Camps, Mount Lily, Potworks, Barnaby and Liburd Hill villages which are all close in proximity. “This community centre, I believe, would become the epicenter of the area and also add to the aesthetics of the community,” he underpinned just moments before recording his gratitude to Minister of Community Development in the Nevis Island Administration [NIA] the Honourable Hensley Daniel. Attorney General and St. James parish resident the Honourable Patrice Nisbett. “Since we started government we had indicated that the focus of our attention is people and these centres are to reflect that very ideal and that very concept,” Mr. Daniel added. Upon completion of the building, residents of Mr. Nisbett’s St. James constituency would receive training in computer skills and leadership and are expected to benefit from the homework assistance programme. “Programmes, which have become too big to be held on galleries and garages or in small buildings or in churches and schoolrooms, will now move to the community centre and that will give the impetus for further community activities in the area,” Minister Daniel stated. Minister with responsibility for Community Development in the Nevis Island Administration the Honourable Hensley Daniel. In addition to thanking Mr. Pemberton’s team at the Public Works Department, the Community Development Minister highlighted Mr. Nisbett’s contribution to the St. James parish. “I want to remind the people of St. James that even though in the 2006 elections they did not vote in overwhelming numbers for Mr. Nisbett, they are getting an overwhelming community centre here in St. James,” he said. 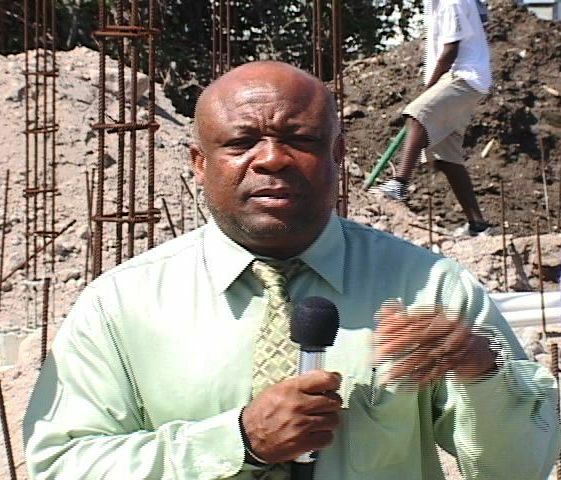 The Combermere Community Centre is being constructed by Mr. Livingston Mills and his team at Livi’s Construction and supervised by the Public Works Department. 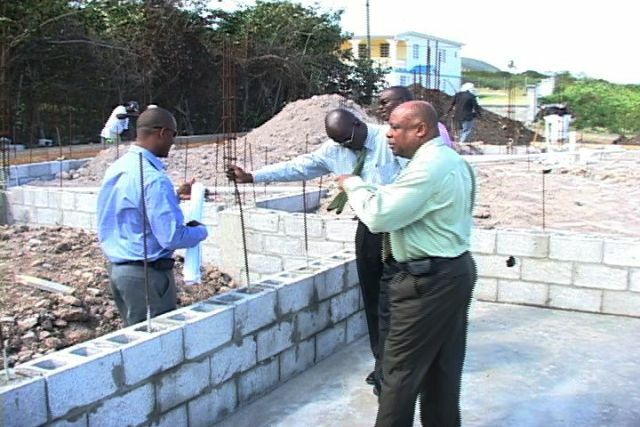 Photo Caption: Director of Public Works Mr. Raoul Pemberton [blue shirt] explains work progress to the Minister of Community Development in the NIA the Honourable Hensley Daniel [green shirt], Attorney General the Honourable Patrice Nisbett [green tie] and Permanent Secretary in the Ministry of Works Mr. Ernie Stapleton [pink shirt].